If you want to change the look of the worksheet, you can do it in a very simple way- by changing the type, size or font color. 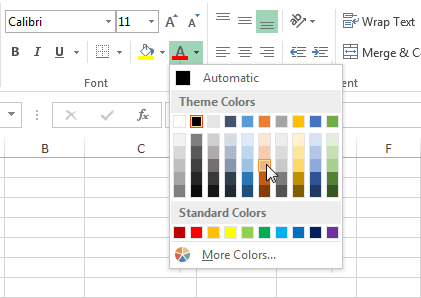 Excel has an interesting feature to automatically change the appearance of a cell and text formatting after you hover your mouse cursor over one of its predefined styles. With this quick preview, you can check how your text will look like if you apply the changes. The default font since Excel 2007 is Calibri, size 11. In Excel 2003 and earlier versions, it was Arial 10. To change the font size, go to HOME >> Font. In the upper left corner of the font area, you will find information about the font that was used in the text. If you want to use another one, click the small triangle on the right side of the font name to expand the list of fonts and choose one of them. On the right side of the font name, you will find the font size drop-down. You can expand the list of sizes or just enter a new one from the keyboard. On the right side of the font sizes, you can find two icons- the first one is used to increase and the second one to decrease the font size. If you want to change the font color, go to HOME >> Font >> Font Color. Here, you will find the most popular colors and their shades. If you don’t find any color that suits your needs, click the More Colors position. A new window will appear. It is divided into two tabs. 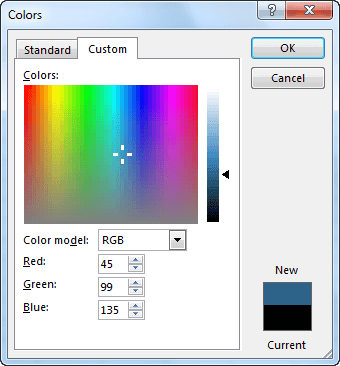 One of them is the Standard tab, which contains a set of standard colors. It will give you access to 127 colors and several shades of gray. 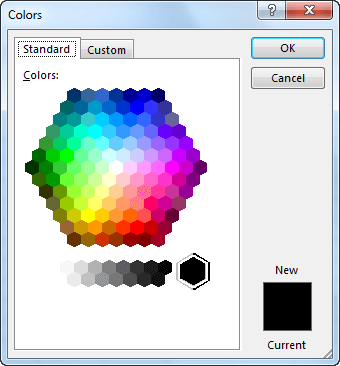 If you are still not satisfied with the number of colors, click the Custom tab. Here, you can create your own colors by changing the intensity of the three primary colors: red, green and blue. It will give you a total of over 16 million combinations.